“It all started when I posted a picture on facebook holding a cake and celebrating my last session of chemotherapy; the caption accompanying the picture read “I survived Cancer for the third time”. Shortly after posting it, the picture was “loved” 20,000 times and was shared 10, 000 times, and that’s how my facebook profile became known. People started visiting my profile in order send me messages of solidarity and support; however, I am openly gay on facebook. This meant that most of the love messages turned into hate ones; moreover, some people wrote to me how they wished that i would get cancer again. I shared one of those messages on my profile, before receiving threatening messages from people I didn’t know. The messages’ senders said that they knew where I lived; however, I didn’t take them seriously and also shared them on Facebook. Two weeks after this incident, I was leaving my house heading to the movie theater, when a car stopped in front of me. Three men stepped out of the car and started beating me up. They were about to kidnap me, except that one of the workers in my neighborhood saw what happened and ran towards us. They jumped back into the car, before one of them said to me “the next time, you’ll be stabbed in your stomach”. 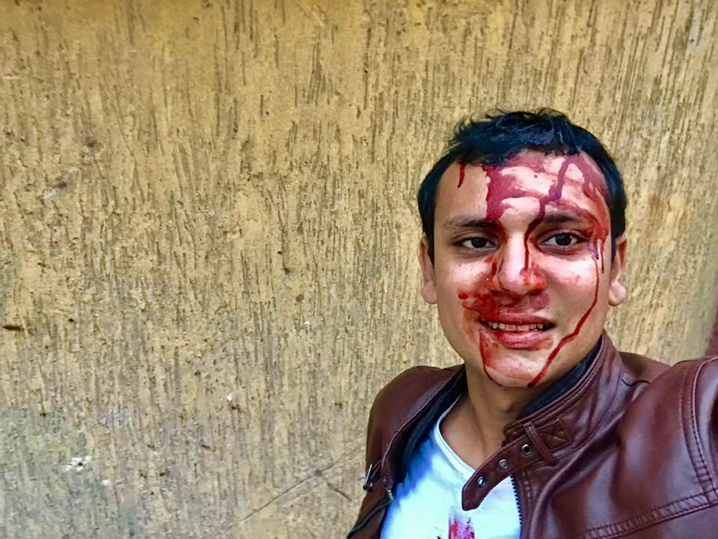 I took a picture of myself to state how homophobia in Egypt looks like and posted it on Facebook. After this, I went to a hospital, where I was stitched; I also had several injuries in my body and arms. 4 hours later, my picture was shared 11,000 times on Facebook; this wasn’t pleasant at all, as I started receiving numerous threatening messages whose senders stated explicitly that they would kill or slaughter me. The story didn’t stop here, as I received a call from a friend of mine that Egyptian police went to the address written in my National Identity card (my mother’s address) and asked about me. Eventually, i had to hide, especially that the hate and threats’ messages were increasing ; additionally, people recognized me two times in the streets, and I miraculously managed to escape. That’s why I deactivated my facebook account. I later knew from a friend, who is a lawyer, that an Egyptian lawyer filed a case against me accusing me of inciting debauchery. On Thursday the 13th of December I received a phone call from someone who said to me “we know you’re leaving Egypt, but we will slaughter you before you do”.